The Trail Which followed the south side of the Platte River was the main route to Oregon and California. Fur traders going to the Rocky Mountains took the first wagons over the trail in 1830. Oregon-bound missionaries followed in the mid-1830s, and the first group of settlers embarked for Oregon in 1841. The number of emigrants reached 40,000 in 1849 after gold was discovered in California. Most emigrants traveled in ox-drawn wagons averaging about fifteen miles a day. In the 1850s and 1860s, freight wagons and stagecoaches carrying passengers and mail used the road. From April 1860 until October 1861, the Pony Express carried mail from St. Joseph, Missouri, to Sacramento, California. Fort Kearny (1848-1871), east of here, provided protection and supplies for travelers. Supplies could also be purchased at nearby Dobytown. One of many road ranches along the Oregon-California trail was located just southeast of this marker. Wagon travel on this overland route declined following the completion of the transcontinental railroad in 1869. 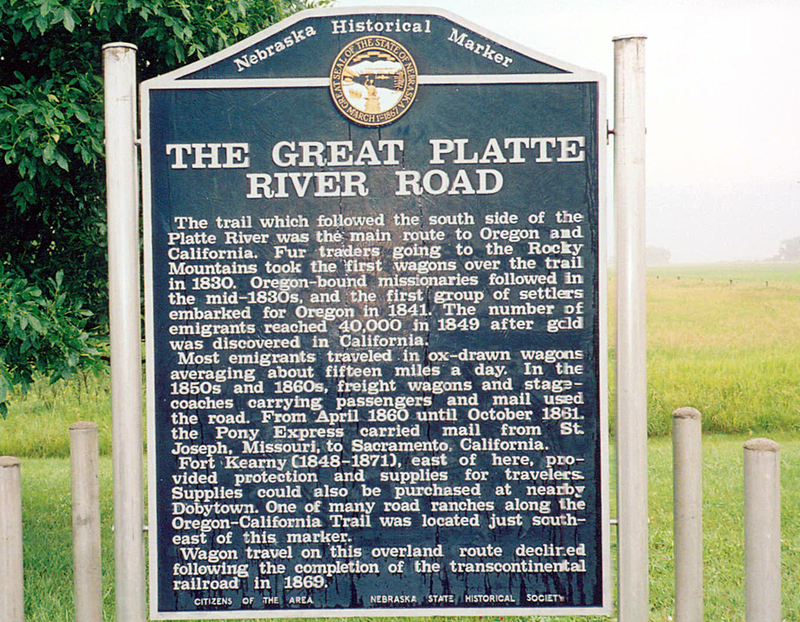 “The Great Platte River Road,” Explore Nebraska History, accessed April 19, 2019, https://mynehistory.com/items/show/301.